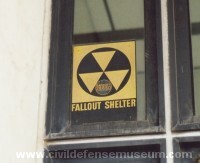 The two most common fallout shelter signs are shown above. The FS1 which is a 14 by 20 inch aluminum sign and the FS2 which is a 10 by 14 inch galvanized steel sign. Both have flat black and yellow reflective paint. 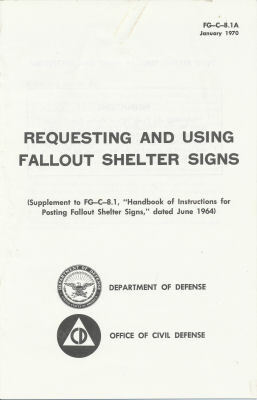 The Fallout Shelter Sign Posting Handbook lists the FS 1 as an exterior sign and the FS 2 as an interior sign but both were posted on the exteriors of buildings with shelters. All DOD OCD issue signs have "Not To Be Reproduced Or Used Without Department Of Defense Permission." at the bottom of the sign. The paper adhesive backed sign (see below) also has the DOD FS No. 2 number designation at the bottom of the sign. 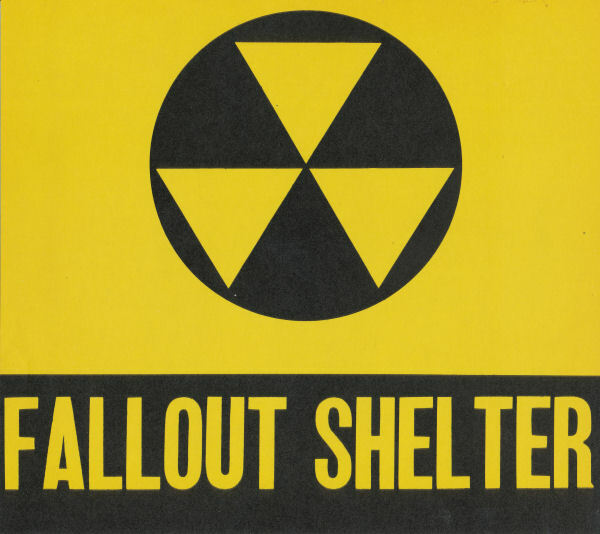 During FY 1962 the shelter marking program consisted primarily of procurement actions for fallout shelter signs. 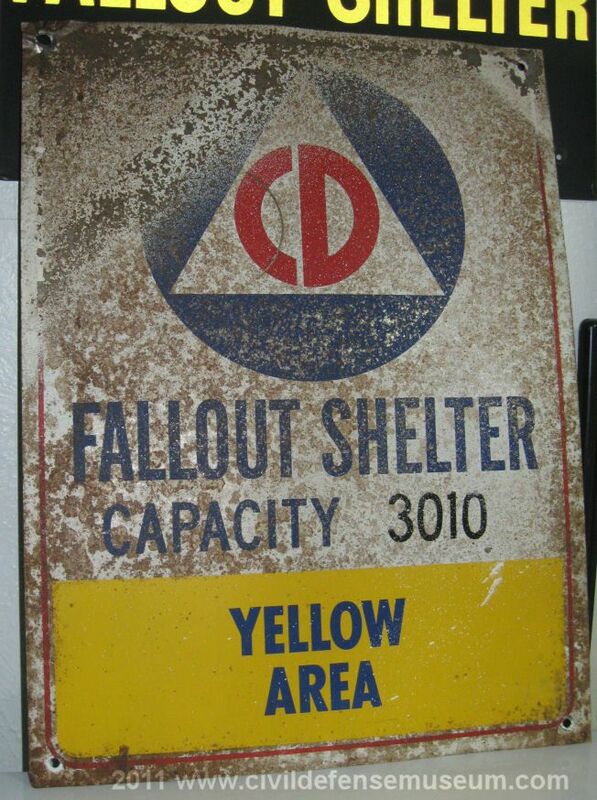 During the year, 400,000 aluminum outside and 1,000,000 inside fallout shelter signs were procured at a cost of $699,800. 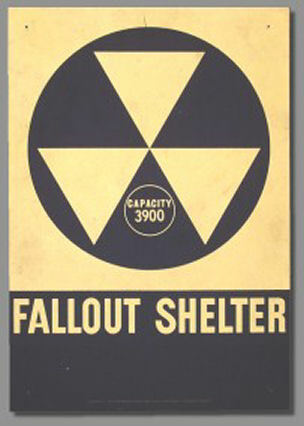 These were shipped to 53 Corps of Engineers and Bureau of Yards and Docks field offices for distribution to the various States and localities and eventual installation in approved public fallout shelters. 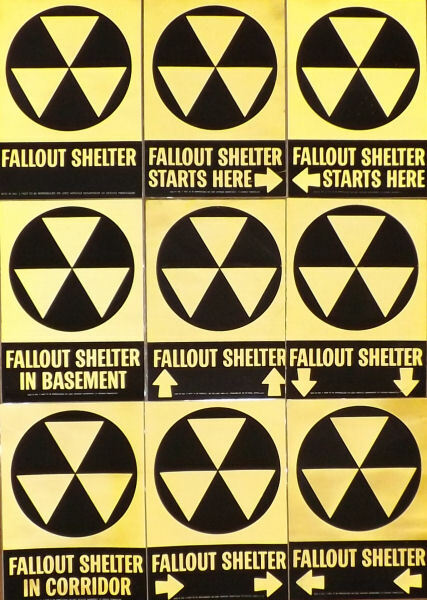 The signs are standard Fallout Shelter signs as shown in the adjoining column. 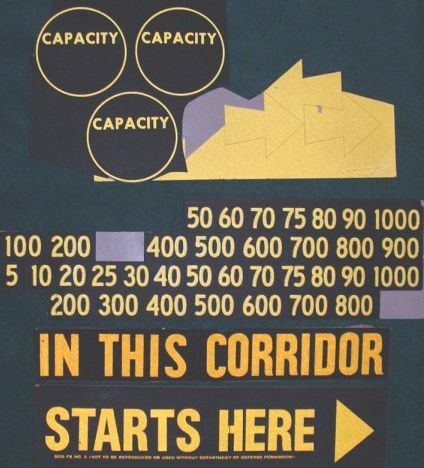 The signs which indicate shelter capacity are colored black and yellow and are indentical in appearance for both inside and outside marking. Aluminum signs are used outside and steel signs are used inside of shelters. 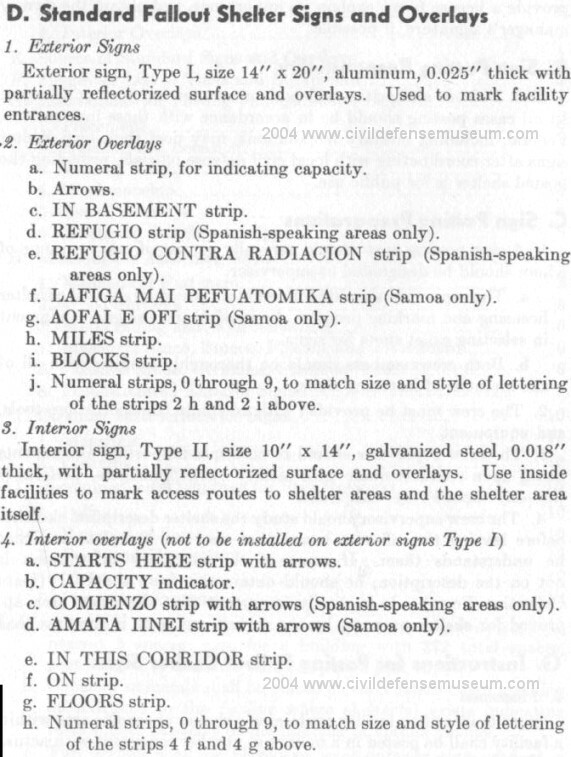 The procedure for marking shelters was as follows: (1) placement by the architect engineer contractor of a small OCD black and yellow pressure sensitive sticker on shelters meeting prescribed requirements, (2) procurement of officials of the shelter owner's signiture on the license agreement and (3) installation of official Fallout Shelter signs by the Army Corps of Engineers or the Navy Bureau of Yards and Docks. The following table summarized the FY 1962 procurement of activity by sign manufacturer, type and size of sign, number of signs and cost of signs. Here is the link to original page 12 from the 1962 DOD OCD Annual Report. DODOCD1962AnnualReptPage12.pdf Thank You Frank Blazich for providing this scan from the 1962 DOD OCD Annual Report! Before seeing this I had no idea that the shelter sign "points" had ever been assigned any meaning. I have never seen the statement by Mr. Pittman mentioned in the paragraph in any other document that I have but since this is a DOD OCD Regional Newsletter I think it's probably a good source to cite. I guess it's something they never really followed up on as a promotional effort. Thanks again to Mr. Blazich for this image! 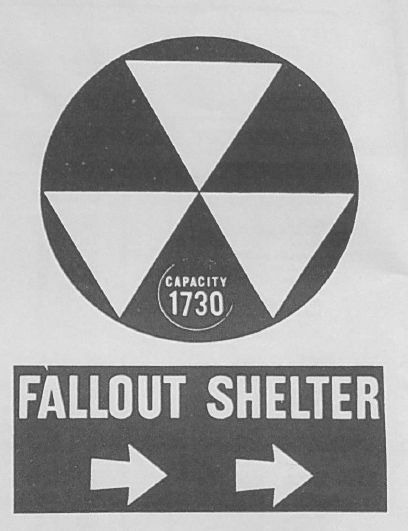 Standard Fallout Shelter Signs section from Posting Fallout Shelter Signs Handbook. 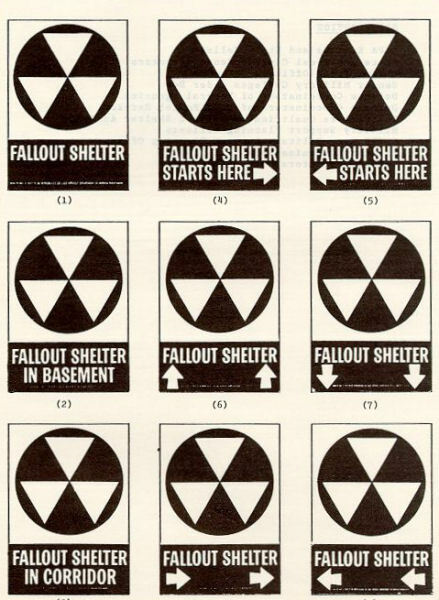 Civil Defense Publication, FG-C-8.1 June 1964 Section D Describing Fallout Shelter Signs. 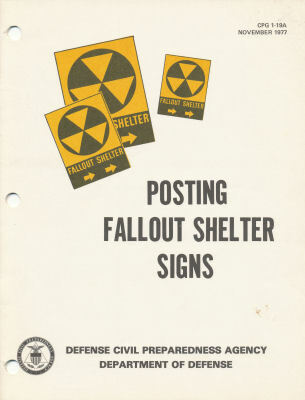 For full fallout shelter sign posting booklet downloads see below. There were also 9 versions of the 7 by 9.75 inch adhesive backed paper signs. The paper signs were also flat black and reflective yellow. 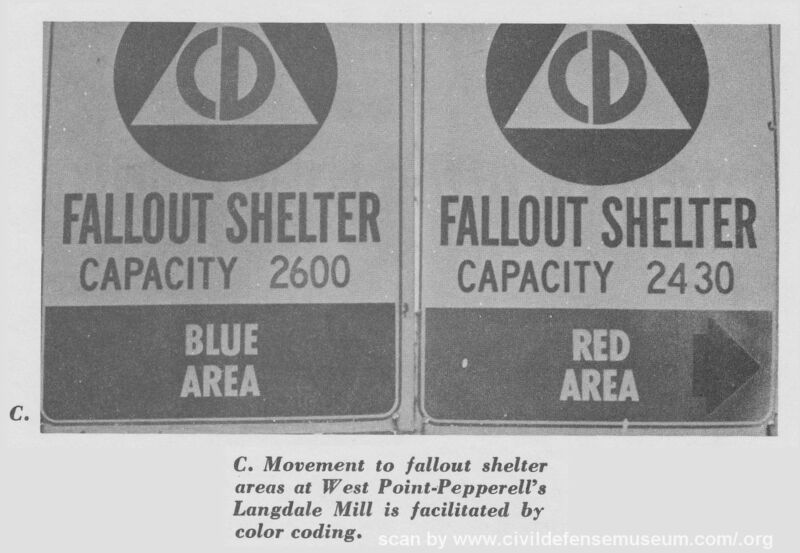 The above left image is a scan from the DOD OCD Posting Fallout Shelter Signs booklet supplement FG-C-8.1A dated January 1970. 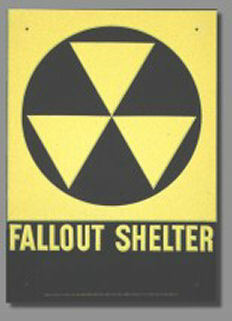 The supplement says these signs can be used in lieu of the Type II interior metal shelter signs under certain conditions. 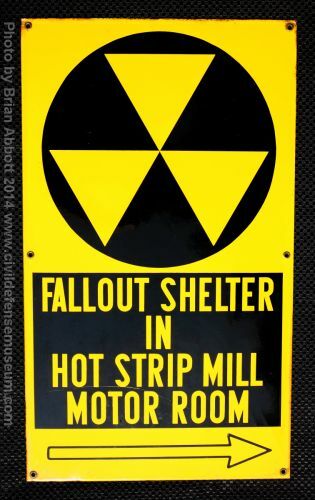 The supplement also says the adhesive signs are intended primarily for interior marking, although in the event of a declared emergeny, they can be used for both interior and exterior marking of all available shelters. 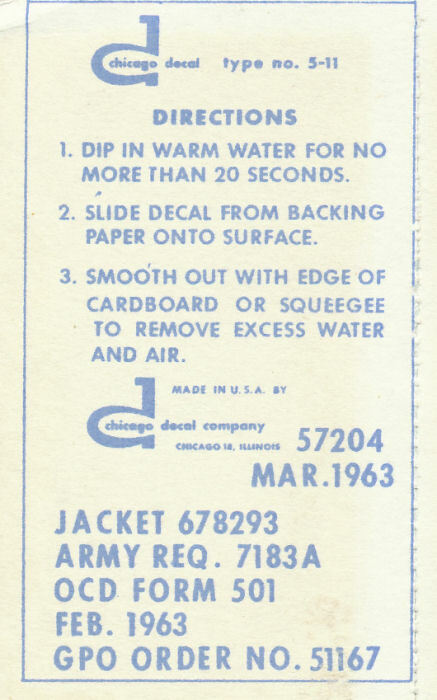 The adhesive backed paper signs are not mentioned in the FG-C-8.1 booklet dated June 1964. I belive the paper signs were issued a bit later than the original metal signs. I have a package of paper signs and the instruction cardboard backing of the package has a 7/67 date on it. 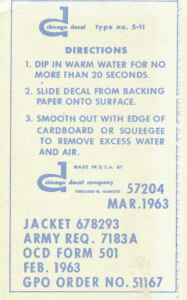 These small decals were also used. They measure about 1-5/8 by 2-3/4 inches and are water transfer decals. 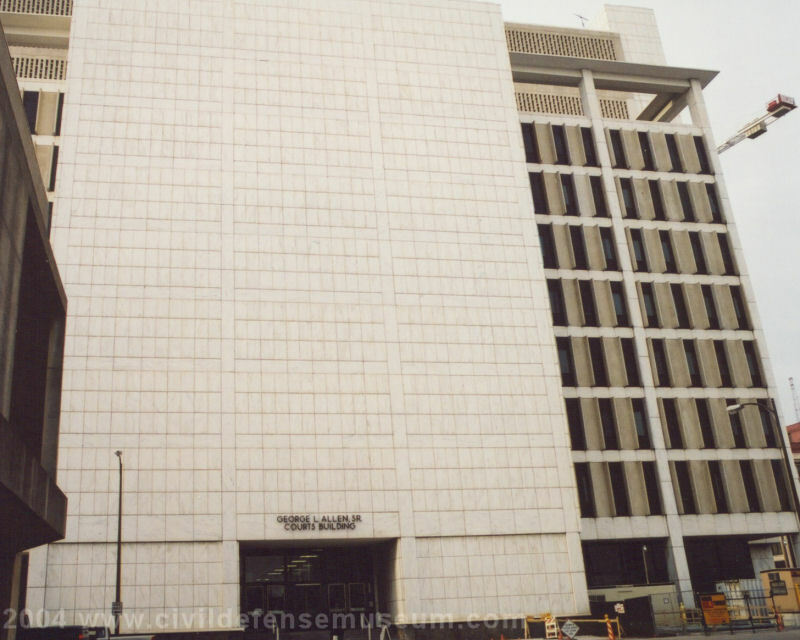 I presume they were ususally put on windows or doors at the front entrances of buildings. I have never seen any still in place in person though. 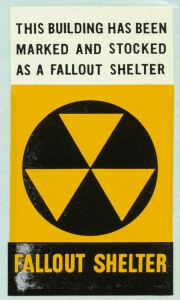 The fallout shelter triangle symbol is often confused with the international radiation symbol for obvious reasons (see image below). 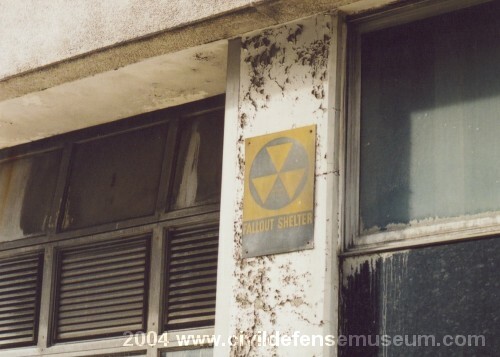 The radiation symbol goes back to just after World War II. 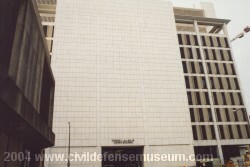 For a history of the radiation symbol (Trefoil) see Oak Ridge Associated Universities Health Physics Museum Page here. 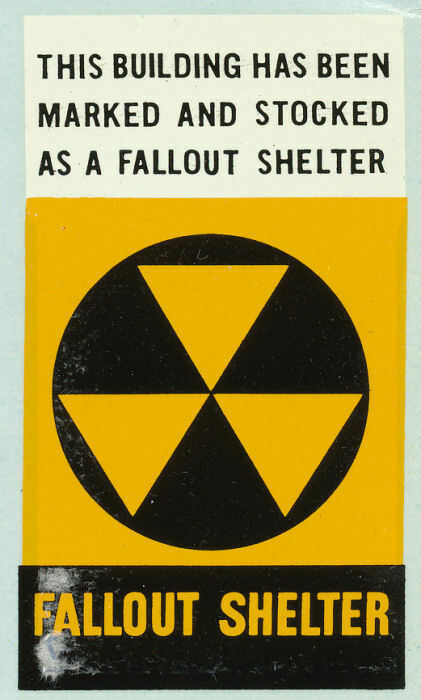 When I look at the radiation trefoil I see 3 "fan blades" radiating from the center, however, the fallout shelter triangle emblem has always looked to me like 3 triangular "arrows" pointing down instead of fan blades radiating out from the center. 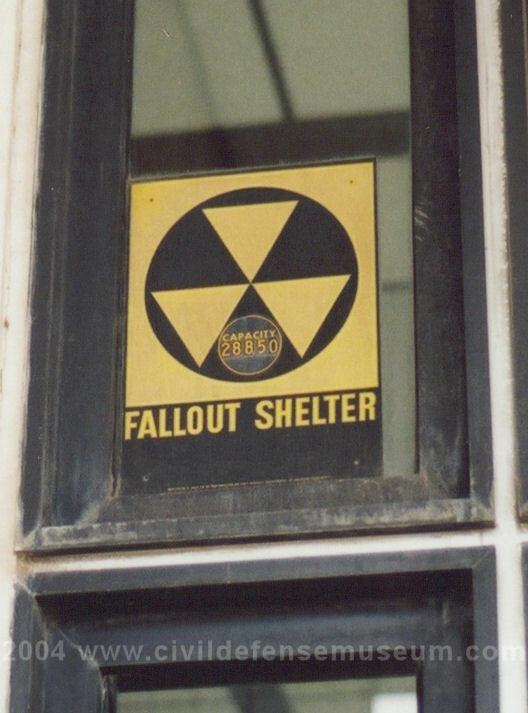 Bill Geerhart put together an excellent article about the History of the Fallout Shelter Sign (I wish I had the time and could afford to research stuff like this) where he cites the "very first sign unveiling ceremony at the Westchester County Building in White Plains, New York at 148 Martine Avenue on October 4, 1961. Check out his article f you have time. He even interviewed the man was in charge of developing the sign. A Couple Of Fallout Shelter Signs In Downtown Dallas. Shelter Sign At Rear Loading Dock. Shelter Sign At Entry Of Courts Bldg. Here are a couple of shelter signs in downtown Dallas. 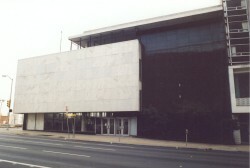 The old Dallas Public Library is a classic mid-century modern work with a shelter sign next to the loading dock door at the rear of the building. The George Allen Courts Building has the highest capacity of any shelter sign I have ever seen. The capacity on the sign is 28,850! Click on any photo to see a larger version. This image and caption are from CD publication number FG-F-3.30 January 1970 "Civil Defense in the Textile, Apparel and Related Industries." This book has info and various photos from several textile mills in Alabama. According to the book the Langdale and Shawmut mills operated by West Point-Pepperell had this type of shelter sign designating different areas in the mills as fallout shelters. The book shows how the West Point company had an extensive company civil defense program. I have never seen this type of sign anywhere else so I believe the company must have had them made. 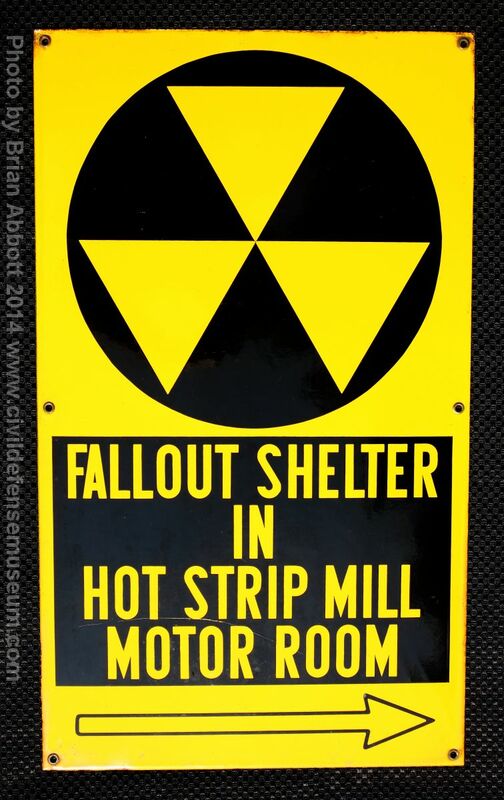 I got the sign in the above photo from an ebay seller in May of 2011 who informed me that it came from the Fairfax textile mill in Alabama. 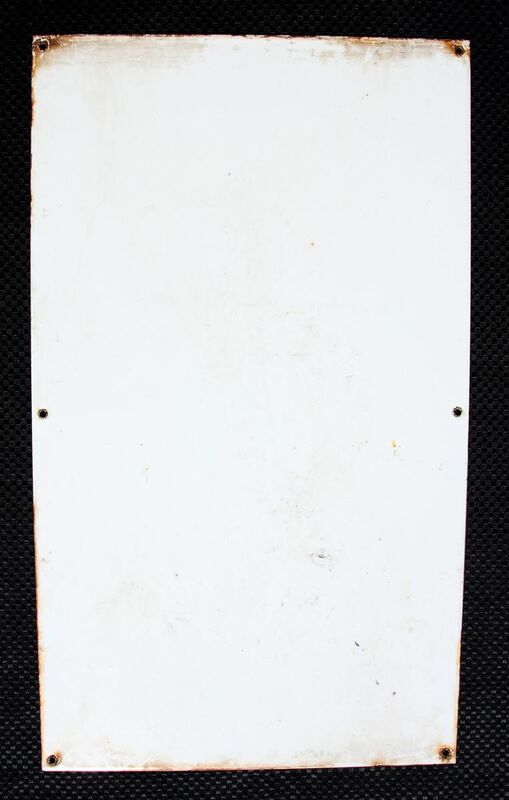 Obviously it's the exact same type of sign pictured in the FG-F-3.30 publication mentioned above. The sign measures 12 by 16 inches. The seller stated the following when I inquired about where the sign came from. "My husband wanted me to tell you that it's not the Langdale or Riverview or Lanett Mills. It's the Fairfax Mill and it's actually being torn down." The Fairfax mill isn't mentioned in the FG-F-3.30 book but I believe it was operated by the West Point company like the other mills mentioned in the book. The mills were loacated in what is now Valley Alabama. Brian Abbott of Parkersburg, West Virginia sent me photos of this sign in 2014. He said it measures 14 by 24 inches and is procelain on heavy steel sheet. It is from a steel mill but he did know which mill it came from. Thank You Brian for taking the time to send the photos of this unique sign. I got these paper signs from an ebay seller around 2004 or so. They are adhesive backed, are flat yellow and black but the yellow is non-reflective. The larger sign measures 9-1/2 by 8-3/8 inches. The smaller sign measures 9-1/2 by 4-1/2 inches. If I remember correctly the seller told me they were from an air force base, for what that's worth. CD Booklets Referenced for this page. 2. 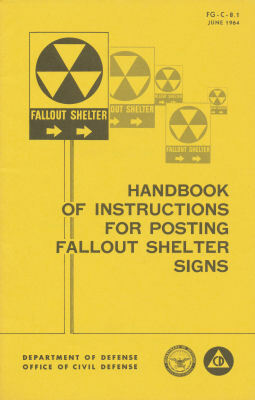 DOD OCD Handbook of Instructions For Posting Fallout Shelter Signs Supplement FG-C-8.1A January 1970. 3. DOD OCD 1962 Annual Report, Page 12. 4. 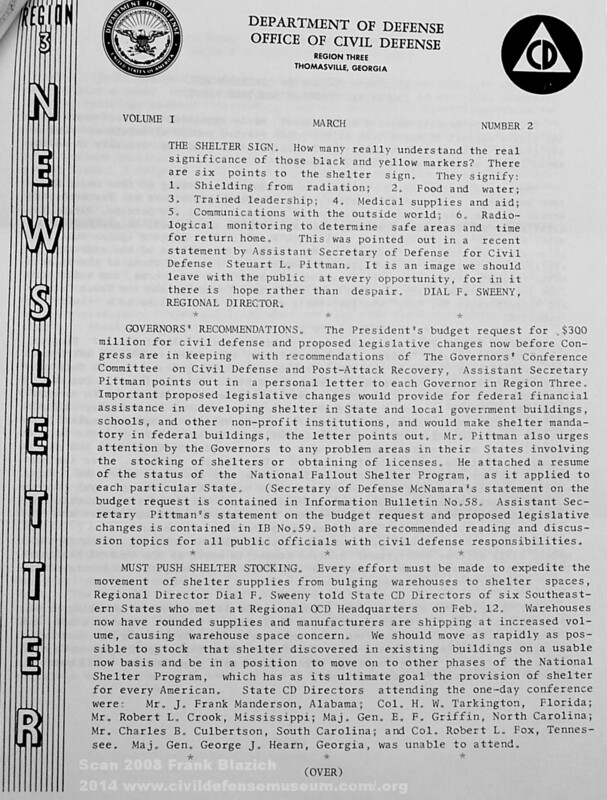 DOD OCD Region 3 Newsletter, March 1963.